adidas Originals JS Wings 2.0 Kicks Appear Just In Time To Welcome Back Kid Icarus | OhGizmo! 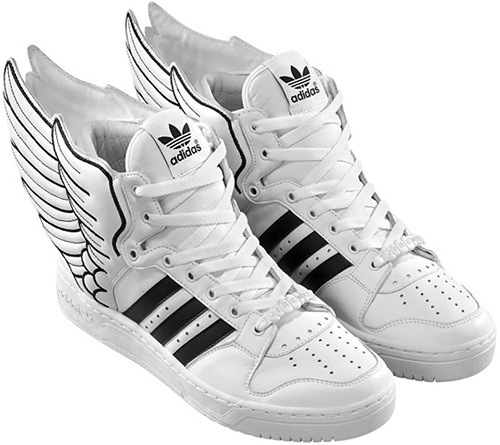 I’m sure these new JS Wings 2.0 shoes, designed by Jeremy Scott for adidas Originals, were already on the drawing board well before Nintendo unveiled the return of Kid Icarus at E3 a couple of weeks ago, but I like to think they’re a subtle way to welcome back a long forgotten video game hero. And yes, I know the image of shoes with wings on them is more associated with Hermes than Icarus who crafted actual wings, but I don’t care. The JS Wings 2.0 will be available starting August 10 from wherever you’ve managed to find adidas Originals in the past, or on eBay a few hours after they’re released. Yes, but are they coated in wax that will melt if I get to close to the sun, thus causing me to fall back to Earth? Or do they give me superspeed so that I can be the fleet-footed messenger to the gods? If these shoes do neither of those things, then they're just a pair of really ugly shoes. Adidas JS Wings 2.0 shoes very Attractice. On peut les achetes ou ?